Happy 2014! It’s Resolution Time! Moving to a new apartment is a major life upgrade, and like any big change it takes time, effort, and patience to set everything up just right. The New Year brings with it an opportunity to reassess and reevaluate. For most of us, that includes taking a hard look at our health and wellbeing and figuring out ways to improve our lives. 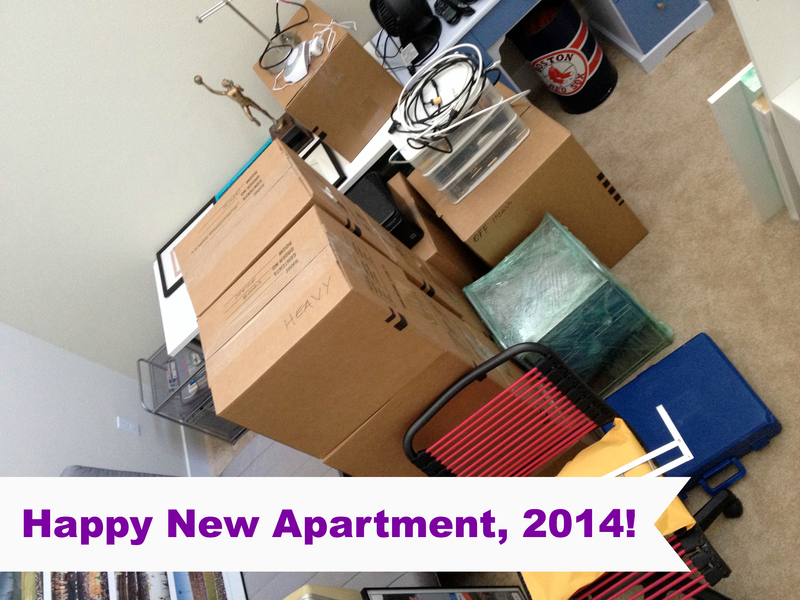 Michael K. Farrell and I spent New Year’s Eve moving to a new apartment. We decided we want to spend less time in the car this year, so moving downtown to be closer to coffee shops and work became a must-do. It was a big change, and we made it happen with about a two-weeks’ worth of hard work—and we’re still swimming in boxes, so there’s another week or so of unpacking to go. But eventually, we’ll feel more settled and have more time to fully enjoy our pedestrian-friendly lifestyle. Change doesn’t happen overnight. And the resolutions you set on January 1 won’t necessarily be accomplished before the month ends. Still, the sooner you start, and the more attention you shine on them, the more quickly you will notice the benefits. Whether your aim is to become a better eater, improve your fitness, or take control of your calendar, here are some ideas to get you started as you set your goals for the year ahead. Eat outside of the box. The easiest way to clean up your diet is to stop eating packaged and processed foods. That means, opting for steel cut oatmeal and berries for breakfast rather than toaster waffles, and fresh fruits and veggies at snack time instead of pizza pockets or cheese twists. Get your blend going. Veggie-heavy green smoothies are another fun way to get more healthy vitamins and minerals into your day. I like to start with spinach or kale, then toss in a banana, frozen fruit, almond milk, and a handful of nuts. There are tons of recipes online if you need a little direction (here are some of mine!). But you really can’t make a mistake with a smoothie, so have fun creating your own signature blends! Just move. Fitness should be fun! I repeat: Fitness should be fun! There’s no rule that says you have to spend an hour a day slogging it out on an elliptical machine, while staring at a gym wall. Get outside! Skip up a hill—don’t laugh, this will make you a faster, stronger runner if that’s your goal. Invite your friends for a power walk and some girl time. Find an activity that you love—track, adult kickball, roller-skating, anything!—and make that part of your routine. You’re more likely to stick to an exercise plan that makes you smile than one you dread. Make sleep a priority. A lot goes on when you’re snoozing, skin cells turnover, muscles go into repair mode, and much more, so skipping a date with Mr. Sandman has negative effects on your health. When you’re exhausted your hormones go haywire, causing you to become cranky, your appetite goes into overdrive, leading to cravings for all kinds of unhealthy stuff, and your immune system slows down, making it nearly impossible to fight off colds and infections. Aim to get eight solid hours of sleep at night, and listen to your body—rest when it tells you you’re tired. If that means napping on Saturday afternoon or sleeping late on Sunday morning, do it. Stop scheduling in stress. We like to feel as though we’re in control of our lives, but the bottom line is: Balance is an illusion. Trying to stick to a rigid calendar can often be more stressful than helpful. It’s easy to feel down on yourself when you can’t fit it all into one day, so my advice is to stop trying. Instead, do what absolutely needs to be done first—like that expense report that’s overdue, and then have tentative plans to do what you love. Only say “yes” to the activities you truly enjoy, like chaperoning your kid’s field trip, and turn down the things you don’t (not everyone was born to make cookies for bake sales). Doing so doesn’t mean you’re a bad person, it means you’re authentic and true to you. Don’t slack off. Science tells us it takes 21 days to fully create a good habit or to give up a bad one. That can feel like a long time when you’re starting out, but sticking with it will not only add a healthy new ritual into your life, you’ll also be proving to yourself that you can do anything you set your mind to—and that’s a powerful lesson. Don’t focus on what you’re giving up. Instead, think about all the positive benefits you’ll be adding into your life. For example, if you decide to stop biting your nails, you’re not losing a coping mechanism for stress; you’re gaining gorgeous hands—not to mention suffering from fewer colds. Or, if you decide to start a daily yoga practice, you’re not losing 20 minutes a day; you’re gaining stronger muscles, greater flexibility, and a more peaceful mind. Did you make any New Year’s resolutions? Share your goals for 2014 in the comments below! Great ideas Kim. Always nice to start fresh. I’m loving your blog and the training aspect of it! Great meeting you at the Whole Foods event! It’s Finally Happened—I’m in a Bad Race Photo!